The Timber Ridge folding roll up table is a solid entry in the roll-up outdoor table market, and will certainly come in handy in a variety of environments, not just camping. This roll-up table is made up of several hinged aluminum bars that form the table top. These attach to a steel frame that forms the legs of the table. This article is a Timber Ridge Folding Roll Up Camping Table Review and looks carefully at this innovative portable table. The whole system is quite ingenious and packs up into a small bag that is easily transported. Setup and breakdown only take a few seconds, which is part of what makes this folding table option so compelling. Of course, camping and setting up tables and chairs in a distant environment is always a compromise, but with the Timber Ridge roll-up folding table, you’ll feel like you’re living in luxury, wherever you are! Note: Timber Ridge provided OutsideModern with this table for our review. All opinions expressed are wholly our own. 1.3 Who is the Timber Ridge Roll Up Table For? 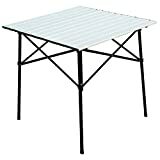 Portable tables and chairs are incredibly useful to have around, whether they are for the patio, camping, going to concerts, the beach, etc. but the table format is inherently difficult to deal with. When it’s not in use, all you can really do with it is place it against a wall for storage, as its form is bulky. And once it’s stored against the wall, many have the tendency to pile stuff on top of it, obscuring it and covering it, making it that much more difficult to extract the next time you intend to use it. A roll-up table solves this problem and is much more convenient to store and move around. These tables pack down into a carrying bag and are super easy to store and access, and could even be left in the back of the car for use when you need them! A roll-up table will likely get much more use than a folding table will, due to the ability to simply get to it whenever you need it. Who is the Timber Ridge Roll Up Table For? Though it’s primarily marketed toward campers, this folding table has a huge variety of potential users. We haven’t yet taken it camping, and we can see how it would be useful for camping. But it’s also simply a useful table to have the outdoor kitchen, for taking to the parks, for picnics, and for general “extra table” usage, both inside and outside! It’s not a super comfortable table to sit around, due to the cross-bar supports, but once you find the right position, you can sit around it. You just can’t move! Where it really shines is as task table: it is super useful for grill prep items and outdoor cooking in general. It’s also a great place to put drinks and food and works wonderfully as a serving table. If you’re going to an outdoor festival, to fireworks, the beach, or any of the sorts of environments where you need to bring your life with you for the day, but aren’t walking super far, this table is ideal to have on hand. If you’re camping, tailgating, and the like, and you have a portable tabletop grill, this table can be an ideal solution for cooking use. You can rest the grill on this table, as well as all your foods and fixins, and then everyone can eat at a picnic table, or in their lawn chairs. No more need to keep the grill down at ground level, no more need to cook bent over. It also would work well indoors as an extra table, and will certainly get used as an indoor folding table as well. You’re more than likely going to want a long tablecloth for the table if you have any intention of using it indoors, as the legs will definitely give it away as a folding table. Still, it doesn’t really look any worse than traditional folding table legs do. Even though this table is called a roll-up table, you don’t actually roll it up. This table folds up in an accordion fashion, with each of the bars sitting flat on top of the one next to it, in an accordion fashion. If you attempt to roll it up, the hinges will lock, and if you try to push it, you will likely damage the table. It’s unfortunate that this is called a roll-up table, but the name folding table is already taken and means something totally different, so we understand why this is called a roll-up table. But just don’t roll it up! This graphic made by Timber Ridge shows the assembly process and is essentially the entire instruction manual. To set up the table, simply unfold the legs and place them on the ground. The more level, the better. Once they’re open, you place the two support pieces across the tops of the legs. In order to do this, you may need to fiddle with the leg frame a bit to get everything positioned in the right place, but it only takes a few sections. Once those supports are in place, you can then unfurl the table top and insert the ends of the leg supports into the two loops at the bottom of the table. The other ends of the table snap into the leg supports, and the table is fully assembled. The first time we set up this table, it took about 2 minutes. Each additional time took about 1 minute, and once you get it the first time, you’ll find that it is very easy to get together and to pull apart. In this section, we’ll discuss the experience of actually using the Timber Ridge table. Overall, the Timber Ridge Roll Up Table provides a pretty solid user experience, with a few caveats. The table slats sit perfectly flat when unfolded, so plates, glasses, and the like sit comfortably on the top without gaps, awkward high or low points, etc. The way that the table top locks to the frame by necessity produce a perfectly flat top on the table. The legs work well to hold the table up, though the cross-bars result in a significant impediment to sitting at the table comfortably. The biggest complaint we have here is that the legs are not telescoping in any way, so if you’re setting up on uneven ground, your table will not be level. It’s not a huge deal, but telescoping legs would solve one of the minor issues that came up when using this table. The cross bars that hold the frame and legs in place form an X, making it difficult to sit at the table unless you’re positioned at just the right spot, right in the middle of the table. And forget crossing your legs, that won’t happen. Because the table is so lightweight, if you shift around your body to try to get comfortable while sitting at the table, it’s easy to jar the whole table with a soft bump. Of course, there has to be a convenient way to assemble and pack away the table, so we completely understand the necessity of the cross bars. Buyers should simply be aware that this table is not super comfortable to sit at for long periods of time, and you’ll need to be careful when you pull your chair in or get up from the table. You want to avoid knocking items over that are on the table. It would be great if the legs adjusted to account for uneven ground, and if the crossbars were a little less of an impediment to sitting at the table. But these are minor complaints, and they are outweighed by a nice build out, great materials choice, and solid design. It’s super convenient and makes going to outdoor concerts, parks, the beach, camping, etc. that much more pleasant. No more needing to haul a large card table around! The fact that it is so easily thrown in the back of the car and transported makes this a great option for those who love to spend time outdoors!